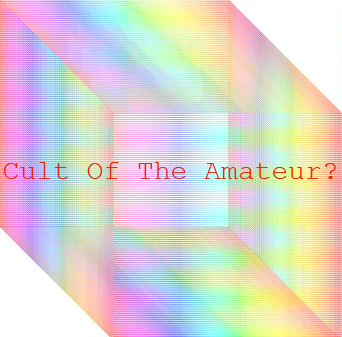 The sixth CYcLE CLUB event at Cell Project Space, ‘Cult of the Amateur?’ explores how artists and curators are using the Internet to create a new context and framework to produce and display art. Referencing Andrew Keen’s publication, ‘The Cult of the Amateur’, this event will contest Keen’s argument that the Internet is killing today’s culture and try to underpin the enormous potential of the Internet’s hybrid activity, which inspires and influences artists today. Acknowledging that the Internet has become a vital tool, source, and arena for a vast amount of contemporary art practice, James Harper has selected bubblebyte.org and POLLYFIBRE as part of this new development. Bubblebyte.org have invited Arcadia_Missa, pyramidd.biz, The Sunday Painter and Hotel Palenque to come together in discussion for a one-night event chaired by curator, Sarah Mc Crory. Turning Keen’s publication on its head, this event will aim to reveal emerging independent / artist-led activity in London that is using the internet to find new ways to display, make, and interact with their audience. Live for 24 hours, and for the duration of the event, bubblebyte.org founders, Rhys Coren and Attilia Fattori Franchini, have invited artist Paul Flannery to create a compliant intervention of Cell’s existing and long standing website. Flannery will interrupt its conventional streamline order to interact with the basic framework of the site, creating a non-linear, auto-destructive viral action. To complete the event POLLYFIBRE will present ‘SlideShow‘, a live work where digital and analogue media collide. The source for this work uses the Internet as a central point of departure in that the script is taken from the Wikipedia definition for the word ‘slideshow’. Information and words are randomly extracted from the Internet and transferred onto photographic 35mm slide to be projected with analogue carousel slide projectors taking the audience into a visual wordplay, from Google to PowerPoint presentation. The sound of projectors is manipulated gradually into a clashing, confrontational, digital/analogue crescendo. Slideshow aims to highlight how information is sourced, navigated and considered in a culture of accelerating mediation. It posits the notion of a post-digital era in which we are increasingly faced with challenging questions of authenticity and authority. Sarah McCrory is curator of Frieze Projects, London. She recently formed ‘Arts & Jobs’ in Bethnal Green, London which opened in March 2012. Arcadia_Missa, The Sunday Painter, pyramidd.biz, and Hotel Palenque are all active independent art organizations that have all developed web-based projects, which are either part or central to their activity. bubblebyte.org is an online gallery showcasing artists that engage in a creative way with the digital space and stress the multiple possibilities of the media. bubblebyte.org is, in itself, container and content, artist and gallery. POLLYFIBRE is a noise band that incorporate amplified analogue tools and machines in live performances that confront and engage digital culture. Founding member Christne Ellison is an artist and lecturer at the University of Reading. For Slideshow at ‘Cult Of The Amateur?’ she will perform with Lucyana Moore and Claire Moss. CYcLE CLUB member, James Harper, is an artist and curator currently studying on the MA curating course at Chelsea College of Art and Design. Harper is a former studio member of ‘The Royal Standard, Liverpool’.